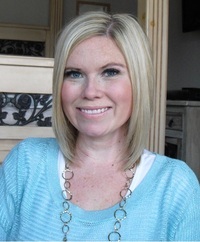 Lindsey K. Rietzsch (pronounced “reach”) was born and raised in Sandy, Utah and currently resides in Davis county with her husband Manuel and four children Gabe, Paisley, Cambrey and Tatem. She holds a Bachelor of Integrated Studies from Weber State University in Social Work, Family Studies and Communication. Lindsey is on facebook and can Lindsey K. Rietzsch (pronounced “reach”) was born and raised in Sandy, Utah and currently resides in Davis county with her husband Manuel and four children Gabe, Paisley, Cambrey and Tatem. She holds a Bachelor of Integrated Studies from Weber State University in Social Work, Family Studies and Communication. My new book "You Were Meant to Prosper" is currently #2 on the bestseller list under "dreams" and "self-help". It's FREE until this Saturday on Amazon. It's all about unlocking your Divine potential so that you can become all that God created you to be. Th story behind how it came about is truly inspiring. Feel free to share!
" David wrote: "Congratulations, Lindsey! I am also an LDS (fifth generation) author of "Falcons and Seagulls, a Utah Tale." I attach links to (1) a rev David wrote: "Congratulations, Lindsey! I am also an LDS (fifth generation) author of "Falcons and Seagulls, a Utah Tale." I attach links to (1) a review by the Association of Mormon Letters, and (2) my blog whi..."
Oh wonderful. Thanks. Can't wait to check it out! ...more "
" Lindsey wrote: "You Were Meant to Prosper"
Hope you enjoy it :) "
" Hi, I'm new to this group. Just wanted to share my new book, "You Were Meant to Prosper" is a #2 best seller right now on Amazon and it's free until S Hi, I'm new to this group. Just wanted to share my new book, "You Were Meant to Prosper" is a #2 best seller right now on Amazon and it's free until Saturday! It's about unlocking your Divine potential so that you can become all that God created you to be! ...more "
" Hi, I'm new to this group. Just wanted to share my new book, "You Were Meant to Prosper" It's a #2 best seller right now on Amazon and it's free until Hi, I'm new to this group. Just wanted to share my new book, "You Were Meant to Prosper" It's a #2 best seller right now on Amazon and it's free until Saturday! It's about unlocking your Divine potential so that you can become all that God created you to be! ...more "
We’d love your help. Let us know what’s wrong with this preview of How to Date Your Spouse by Lindsey K. Rietzsch. It's such a pleasure having you for a friend here at Goodreads. I look forward to reading your work. Thank you so much and best wishes to you.